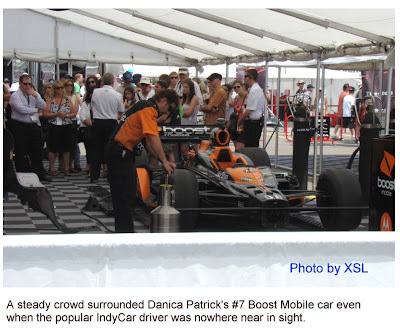 XSL Speed Reporter: Danica, please stay in IndyCar racing! Without Argument, the attention drawn to Danica Patrick in the IRL IndyCar series can be described like a halogen light beam through the darkest hours of open-wheel racing. As the IRL was still attempting to prove itself as a support-worthy series, Rahal/Letterman Racing created some vital headlines in 2005 by drawing a 22 year old Danica Patrick into the open wheel series. Having shown promise in the Toyota Atlantic series the year before for Bobby Rahal's cars, her rookie year in the IRL IndyCar series caused a storm of intrigue highlighted by a starting and finishing fourth in the Indianapolis 500 as well as by three pole awards. Quickly she fostered a passionate fanbase as admirers enamored themselves to the racer for a variety of reasons. While some of those onlookers being Maxim magazine readers seeing an attractive woman, others enjoyed seeing one of the most passionate drivers on the IndyCar roster dicing, including a large contingent of female fans who now freely support open wheel racing. Since then, Danica Patrick joined Andretti-Green Racing becoming a leading figurehead of the IndyCar Series and one of the sport's top moneymakers through endorsements even while her on-track performance has resulted with only one win at the Twin-Ring Motegi circuit in 2008. Having such a magnetic pull, its little wonder that NASCAR would want Patrick racing in the stock car series. Rumours of Danica Patrick's move to the full-bodied stock car series started to mount last year but ended as idle allegations. This year, her current contract to drive the #7 car of Andretti-Green Racing nears completion, the rumour mill is in full swing again. Speculation strongly hints at her leaving the so far winless team for 2009 in search of other opportunities. While some sources indicate staying in IndyCar (A third Chip Ganassi car has been mentioned) or Formula One with one of the developing US teams, NASCAR has been one of the most championed routes. Fueled by visits to race shops, little else has indicated what direction she may be pursuing. However, this fragment of news was enough to drive the newsrooms of major auto racing media outlets going crazy about the idea as having a top female racer in one of NASCAR's major divisions. With Danica Patrick being potentially wooed to NASCAR, she would be far from the first open-wheel driver to enter the series. Eying lucrative deals sparred by NASCAR's growth through the 1990s into the first half of this decade, even a middle tier driver in the Sprint Cup series can earn $3 million a year excluding endorsements and souvenir sales. Appearing on Forbes #100 Celebrities list for 2009 making $7 million US, Danica Patrick may not immediately stand to prosper from a NASCAR deal. In a competitive and financial gain standpoint, her only chance elevate herself in NASCAR is to sign with one of the best teams as she's indicated to be the only way she would make the move. With Hendrick Motorsports and Roush Racing full, finding a winning ride is complicated as Joe Gibbs Racing has no interests in expanding their team for 2010. The likeliest NASCAR opportunities again exists with Chip Ganassi who partly owns Earnhardt/Ganassi Racing. With the #1 car vacated by Martin Truex Jr at the end of this year, EGR has shown some impressive pace this year but would have Patrick enter into another win-starved team. There could also be possibilities in Nationwide competition but she would not likely run a full season in a development series following years in IndyCar racing. A cautious note to Danica Patrick with a transition to NASCAR can be marked by the short-lived careers of other open wheel transplants. After winning the 2007 IndyCar championship, Dario Franchitti's outing in NASCAR Sprint Cup ended after just 10 starts. Having also started the Sprint Cup season of 2008, Jacques Villeneuve and Patrick Carpentier would not finish the year in their rides as a result of a hotly competitive series. However, the success of open wheel migrants Tony Stewart and Juan Pablo Montoya can bring some promise. Finally, in simplest terms, Danica Patrick belongs in the IndyCar series. 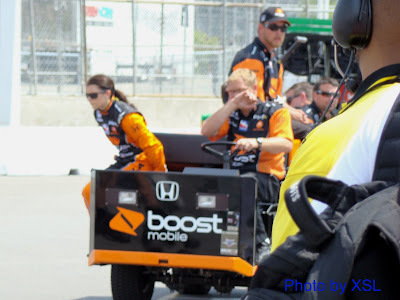 With 2009 being the first year of the completely reunitified professional open wheel body, Danica Patrick's presence in the series has allowed for maximum exposure for her and the IRL IndyCar series. Though winless so far in 2009, Danica Patrick has locked down 9 top 10 finishes and sits 5th in the points standing for her best year overall. Also, fans in IndyCar no longer thinks of Danica Patrick as a woman driving a race car but rather a race car driver who just happens to be a woman. She's really one of the guys in the competition standpoint. With the motorsport world likely to be gravitated on Danica Patrick's decision for where she is racing in 2010, her path will be followed by a legion of male and female fans.